Prefab reverse-engineers the pixels in GUI's. Informed by how commonly-used user interface toolkits paint interfaces, Prefab features a separation of the modeling of widget layout from the recognition of widget appearance. Before Prefab, a researcher who wanted to study a new interaction technique in the context of rich and realistic applications, or a practitioner who wanted to adopt a technique from the literature for an application, was generally faced with the prospect of re-implementing huge portions of a toolkit or an application. Most instead choose to demonstrate techniques only in toy applications or to develop applications based in simple combinations of standard widgets. 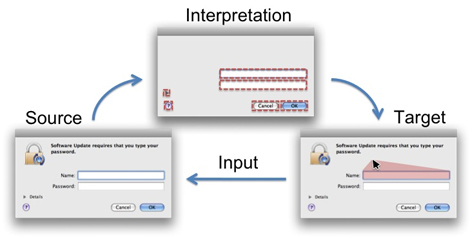 The difficulty of implementing new interaction techniques in new and existing applications and toolkits is limiting the progress and impact of human-computer interaction research. Prefab contributes pixel-based reverse engineering of interfaces that separates modeling of widget layout from recognition of widget appearance, Prefab enables a practical approach to adding advanced behaviors to new and existing interfaces independent of particular user interface toolkits. In addition to its direct implications for human-computer interaction research and practice, Prefab can help to break some of the critical mass and chicken-and-egg problems currently limiting user interface tools research. Prefab will receive a Best Paper Award at the ACM Conference on Human Factors in Computing Systems (CHI) conference in April 2010.